Gunnerson Labradors are located in Mansfield, Victoria about 2 hours north east of Melbourne. We are breeders of black, yellow and chocolate labradors for show and pet. Our girls are mated to stud labradors owned and shown by Marj Deignan, a breeder of labradors for more than 40 years. Most of her sires have their title of Australian Champion or are accruing points towards this. 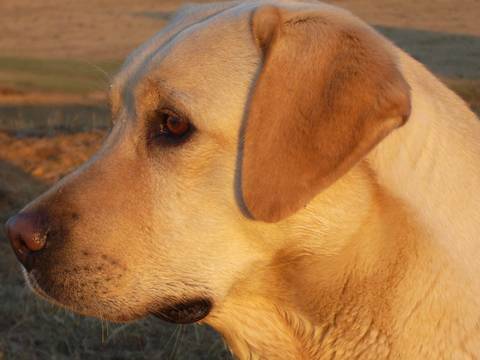 We breed principally for the wonderful labrador temperament, soundness and type. All parents of our puppies are hip and elbow scored and hold clear, current eye certificates. All puppies are registered with the V.C.A. (they come with "papers,") are microchipped and vet checked. At 8 weeks of age when the pups are ready to leave mum they have been vaccinated and regularly wormed. Our pups are raised in the country with children, dogs, cats, calves, horses and chooks. They are weaned onto a natural diet of bones, meat and fruit and vegetables. When our pups leave our care their new owners are given a folder with all the information needed for a happy, healthy pup. We encourage any feedback and are happy to answer any questions, after one week or one year. 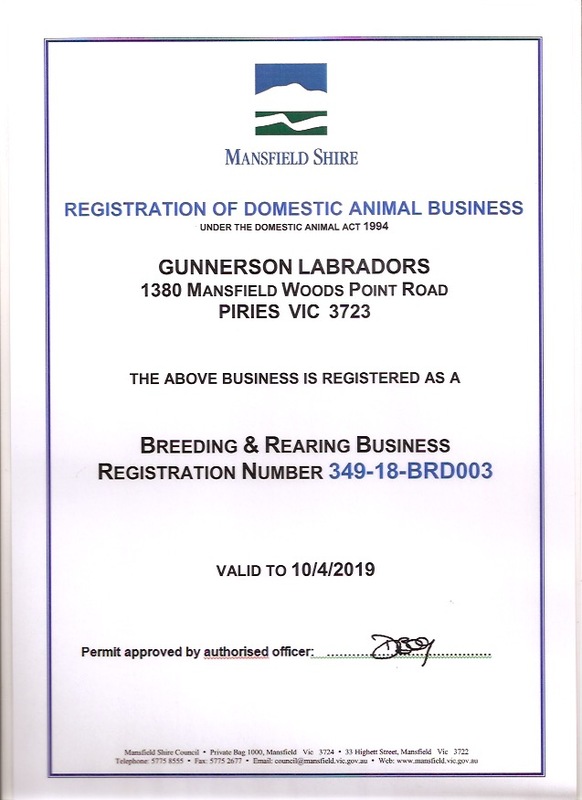 Gunnerson Labradors are members of Vicdogs, the Labrador Retriever Association of Victoria and have a current Registration of Domestic Animal Business. 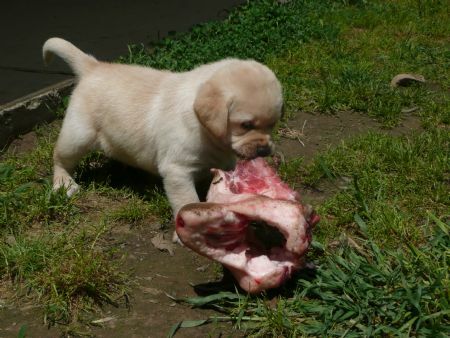 never too young for fresh bones!